Asthma is one of the most common chronic syndromes worldwide (Moorman et al., Vital Health Stat 3(35), 2012). It is not a diagnosis but a clinical syndrome based on a constellation of signs and symptoms (Li et al., Ann Allergy Asthma Immunol 81:415–420(IIa), 1998). The classic symptoms of asthma include chest tightness, wheeze, cough, and dyspnea (Moorman et al., Vital Health Stat 3(35), 2012). The term asthma encompasses a spectrum of pulmonary diseases sharing the hallmark of reversible airway obstruction and can be classified as allergic or non-allergic (Löwhagen, J Asthma. 52(6):538–44, 2015). 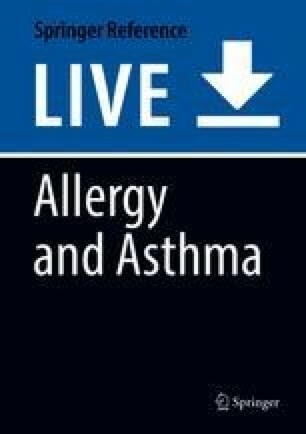 Asthma designated allergic is due to an immunoglobulin E (IgE)-mediated process, but as noted not all asthma is allergic in etiology (Romanet-Manent et al., Allergy 57:607–13, 2002). The differential diagnosis for asthma is broad and requires a detailed history with supportive pulmonary function tests to be properly diagnosed.